February sure flew past! I have to say, I had so much fun this month! There was a lot of coffee, wine, and book-related delights! I also had the chance to take part in a Q and A for Booklikes, which really made me feel warm and fuzzy inside! I know it's not that big of a deal, but it's nice to be acknowledged for something you work hard on. See my post about it here! John Dies at the End by David Wong - It's surely becoming a regular enjoyment; taking part in the monthly group reads of Horror Aficionados! I honestly wasn't sure about this one at all - it sounded way too silly for my taste. How wrong I was! What a great start to the month! The Devoured by Curtis M. Lawson - I was requested to read and review this one by the author. I'm glad I did, as it was a bit different than my usual reads, but in a good way. I promptly consumed it and reviewed it. Hidden by Benedict Jacka - I started this series in 2015, whilst still in my Urban Fantasy phase. What intrigued my about it, was that it had a male protagonist, something that's not all too common in the genre. This series has never been perfect for me, but I still like to see what trouble Alex gets himself into. The Fallen Kind Vol I: Ghosts Of Nunchi by M. Almelk - After being contacted by the lovely author, I quickly accepted his request! Post-apocalypse but on another planet? It certainly piqued my interest. I reviewed it here. Preta's Realm by J. Thorn - A last minute read for the month. Having been on my Kindle for a long time, I decided to finally give it a shot. It was short, and it included some truly disgusting scenes. I strive for two reviews a week, but I had extra space this month, so I included reviews from last year. I think I'll do that - start to post old reviews, just to have them on this blog. On Goodreads I have over a hundred reviews, dating back to 2011! 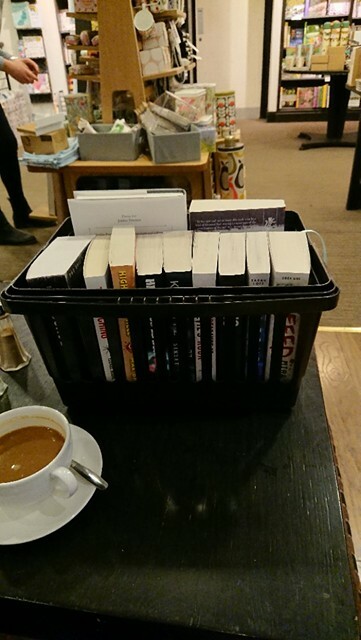 This month also included a trip to Waterstones, and a basket full of books! All horror, of course.